Today, I challenge you to use keyboard shortcuts! 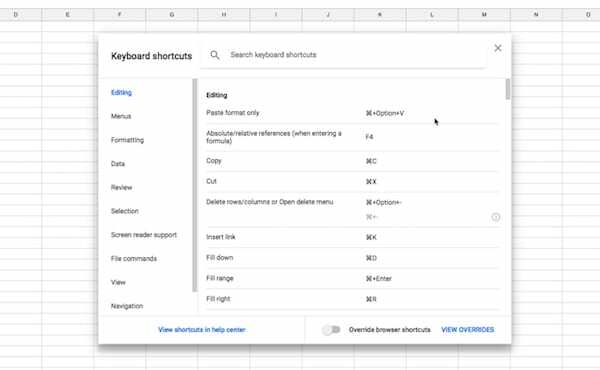 Click here for the Google Documentation for shortcuts. 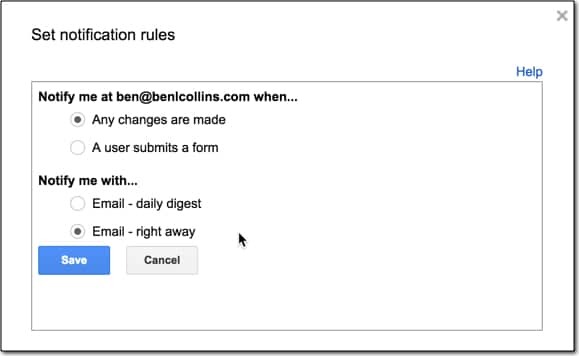 Stay informed of changes to a Google Sheet by setting Notification Rules to send you an email. Comments are one of the killer collaboration features embedded in Google Sheets. 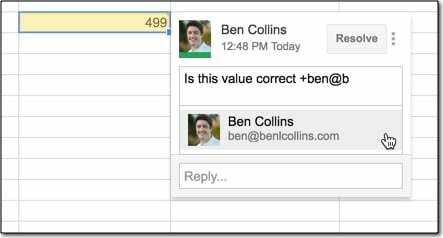 You can alert someone to a specific comment in a Google Sheet by adding their email address. You can then tag specific people in each comment if you wish, which means they’ll receive an alert that they’ve been mentioned in a comment. For example, you might tag Jenny in Finance to ask her to check if your calculation is correct. It’s way easier than trying to explain something via email! You tag someone in a comment very easily by typing a “+” or “@” in the comment box, and then adding the email address of the person you want to notify. As you start typing, Google will auto-suggest email addresses from your contacts list. Create hyperlinks within your Google Sheets to make it easier to find information. You can add hyperlinks to different tabs or even directly to individual cells within your Google Sheets. Quickly drag the column header row down to freeze panes. It has the one drawback of creating the Sheet in your root Drive folder, so you have to manually move it to the folder you want. Create a new Google Sheet in the folder you’re in by using Shift + S.
If you have a specific folder open in Drive and you want to create a Sheet in that folder, just hit the shortcut Shift + S when you’re inside that folder to create a new Google Sheet there. Interested in more productivity tips? Check out this article about my thoughts on how to maximize productivity at work. Is there a way that I could pull in comments into a master worksheet?For example when a comment occurs I can have that data go to another sheet. This is my use case (if this helps) I have multiple teams on multiple sheets and they leave comments for me. Rather than plowing through emails everyday I would rather have one master sheet which “collects” the comments from the various sheets to see there.